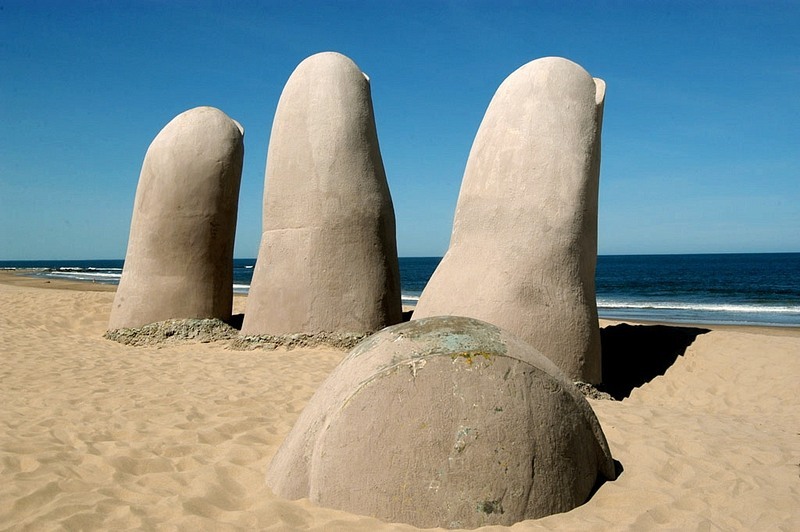 The Hand of Punta del Este, or Mano de Punta del Este, is a sculpture of a hand partially emerging from sand and located at Brava Beach in the popular resort town of Punta del Este, in Uruguay. 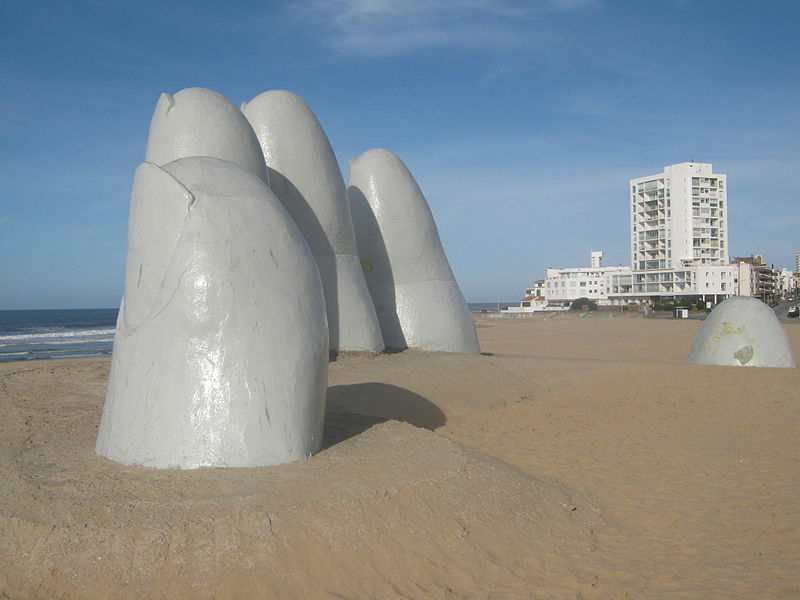 The sculpture was made by the Chilean artist Mario Irarrázabal and unveiled during the summer of 1982, while he was attending the first annual International Meeting of Modern Sculpture in the Open Air in Punta del Este. 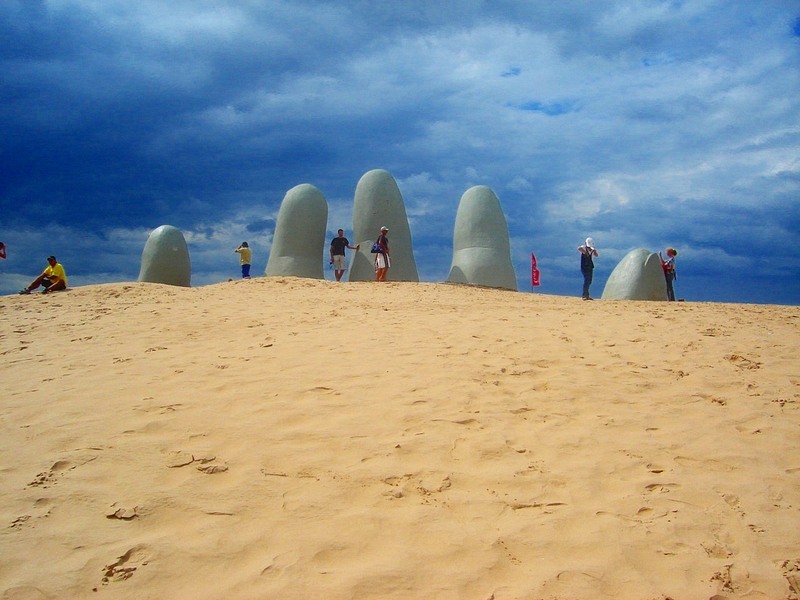 The sculpture has since become a symbol for Punta del Este and is one of Uruguay's most recognizable landmarks. 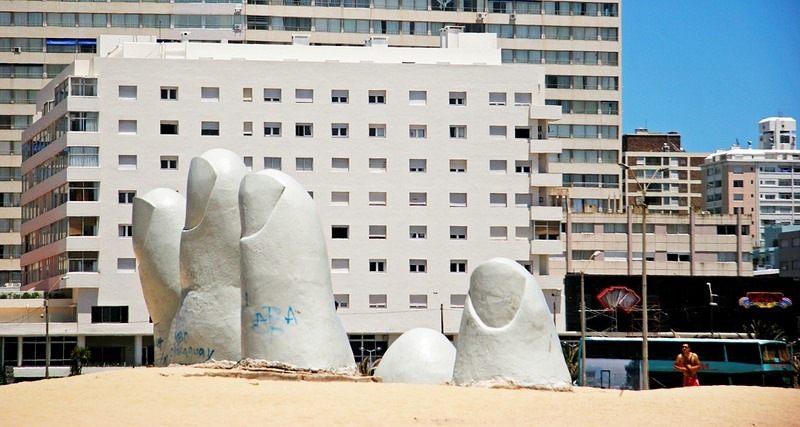 Over the years the sculpture came to be called by different names such as Emergiendo a la Vida (Man Emerging into Life), Monumento los Dedos (Monument of the Fingers), and Monumento al Ahogado (Monument to the Drowned), although the creator prefers it to be called simply “the Hand”. Mario Irarrázabal was the youngest of the nine sculptors who were invited to attend the inaugural edition of the International Meeting of Modern Sculpture in the Open Air. During that summer, the seafront turned into a kind of outdoor workshop where artists from various countries gathered and began to give shape to what they had in mind. 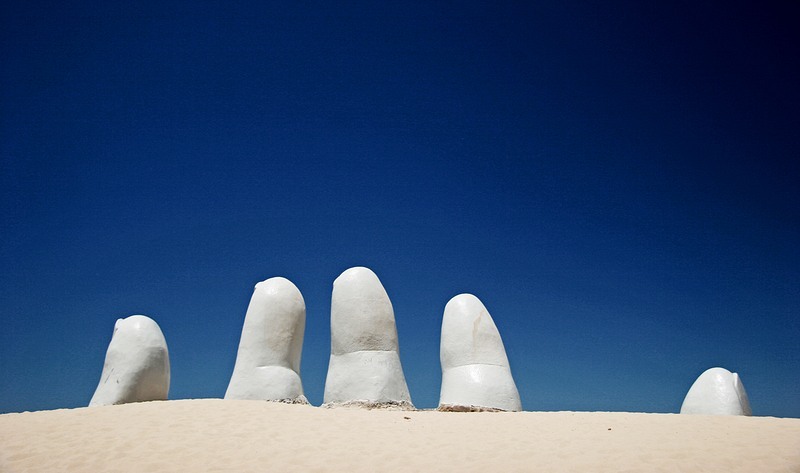 Mario Irarrázabal arrived with a scale model of the hand but he had to improvise the rest of the process while facing natural obstacles such as the wind and the sand. Unfortunately, a conflict arose among the participating sculptors regarding the places assigned on a public square. While the others argued, Mario Irarrázabal quietly took his creation to the beach. Irarrázabal finished his work in just six days. The colossal hand is made of concrete reinforced with steel bars, and metal mesh, and covered with a degradation-resistant material. Irarrázabal's sculpture became an immediate hit earning him worldwide acclaim. It’s the only sculpture from the exhibition, hosted more than two decades ago, that continues to sit on the beach today. It has been photographed by thousands of tourists and has appeared on countless postcards and magazines. Mario Irarrázabal later made near or exact replicas of the sculpture for the city of Madrid (in 1987), in the Atacama Desert in Chile (in 1992), and in Venice (in 1995).